in New Orleans spend their nights—and days—partying too hard to protest. Yet it’s far closer to the truth to say that many observers have been too enamored of the city’s festive culture to notice the undercurrent of resistance it’s always had. Tiane Oliver began her activism young—when she was just 9 years old, amid the turmoil that followed Katrina. The history of New Orleans is, in many ways, a story of resistance—of music born against a backdrop of slavery and Jim Crow, dancing alongside death, community in the face of assault, and a general refusal to conform to the bias, hierarchies, and even temporal demands of the rest of the country. In fact, it’s possible to argue that the city’s mere existence—with its defiant African and Caribbean traditions, maintained inside the fortress of white America—is itself a form of resistance, or at least a kind of queer defiance. In the last few years, New Orleanians of all ages and backgrounds have been on the move, parading through the streets in an effort to wring some justice from the warped post-recovery landscape. Students have led walkouts from multiple high schools in response to zero-tolerance discipline policies and the firing of black teachers. Hundreds of musicians and supporters have taken over City Hall to protest a noise ordinance that would muffle their music. Displaced public-housing residents have marched through the streets, demanding jobs in the federally funded rebuilding of their neighborhoods. And recent immigrants, some undocumented, have braved arrest to protest deportations. In June, more than 100 white antiracist activists joined a rally and teach-in against white supremacy and displacement. At the same time that the movements for black lives, fair wages, and workers’ rights have spread across the country, the people of New Orleans have reflected these national struggles back in their own uncommon style. Days after Michael Brown was killed in Ferguson last year, scores of young black men and women and teens marched into a French Quarter police station and held a rally—inside the station. Transgender youth of color led the city’s first major transgender-rights march. At least 600 Palestinians and their allies marched through downtown New Orleans to protest US support for the Israeli occupation. And fast-food workers led demonstrations inside their restaurants. This moment can be understood as a legacy of the storm—or perhaps a legacy of the storm’s legacy. In the same way that many activists in the Black Lives Matter and Occupy movements say their political awakening grew out of the frustration they felt with the lack of change in the Obama era, many activists here say that the period of planning and rebuilding after Katrina showed them they needed to fight for this city, or it would be taken away from them. led to some real victories. Because of El Congreso’s work, the New Orleans city jail became the first in the Deep South to refuse cooperation with Immigration and Customs Enforcement requests to detain undocumented suspects who would otherwise be released. The group has also helped to win citywide protections against wage theft by employers and harassment by police. When protest loses its punch, people are building alternative structures like the community land trust in Mid-City, part of a strategy to keep prices affordable in the rapidly gentrifying neighborhood. Yet what makes this moment interesting is not merely the passion of nightly organizing meetings, but the particular style of organizing that has grown out of the city’s Creole, urban mix. Today’s organizing takes lessons learned after the storm and mixes them with a culture born from decades of black-led resistance to white supremacy, producing something at once familiar and new. Music is often involved; so are food, conversation, and a deep commitment to consensus and community building, which often takes place through sharing personal histories, in a process born during the civil-rights movement. This approach was evident as El Congreso’s meeting kicked into gear that late spring night. After the call-and-response warm-up, the meeting turned into a Paulo Freire–style workshop, with community members acting out the role of the cops who have harassed them, while others ran the gantlet in a taglike game that emphasizes the combined threats from different law-enforcement agencies. This was followed by announcements, with organizers encouraging members to take part in an upcoming Black Lives Matter protest, and a theater production performed by transgender and gender-nonconforming black youth from BreakOUT. From its earliest days as one of most brutal sites in the global slave trade, New Orleans has existed atop a substrate of toxic racism—of bloody massacres, free-roaming hate, and government-backed discrimination. The official state violence of slavery had barely ended when, in July of 1866, white rioters used the excuse of a black political convention in downtown’s Mechanics’ Institute to kill dozens of people. Eight years later, the Crescent City White League militia led an armed uprising in New Orleans aimed at ending Reconstruction. The violence continued down through the decades—through the Mississippi floods of 1927, when local officials dynamited a section of the levees outside New Orleans, displacing hundreds of thousands of black residents throughout the region; through the rise of a corrupt and brutal police force that often operated like a criminal gang; through desegregation and resegregation, and repeated outbursts by terrorist hate groups like the Ku Klux Klan. As recently as 1980, the police were accused of unleashing a reign of terror in the housing projects of New Orleans’s Algiers neighborhood after a white officer was shot. Four black residents were killed and dozens more were beaten or tortured. In 2000, David Duke marched proudly through New Orleans, Confederate flag waving above him, as a participant in the Irish-Italian parade. This was the crucible in which the city’s long tradition of resistance was forged—sometimes militant, sometimes nonviolent, sometimes subversive, often against grisly odds. In 1811, just outside New Orleans, one of the largest uprisings of enslaved people in US history marched downriver in a revolutionary campaign to create a black republic. And it was New Orleans that managed to create the first integrated public-school system in the South—a system more integrated than many schools across the United States are today—even as marauding bands like the Crescent City White League militia continued their efforts to intimidate black residents. In the 1960s, many of the most infamous battles of the civil-rights era happened in other states, but New Orleans had strong chapters of the NAACP and CORE, supported by an infrastructure of one of the largest labor movements in the South. It was this civil-rights infrastructure that campaigned to reintegrate the school system in 1960, when the images of 6-year-old Ruby Bridges and angry white mobs became iconic. And it was this same infrastructure that, in 1963, helped mobilize 10,000 African-Americans (and 300 white allies) to march on City Hall to demand equality, integration, and an end to police violence. For Salaam, like many others, Hurricane Katrina was a continuation of the city’s gnarled history of racial injustice. Once again, levees broke, black communities were displaced, police and vigilantes declared open season. The recovery was also shaped along the lines of race and gender—with attacks on the teachers union, public housing, and black political power itself. In the context of a history of whites using violence to retain control of city government, the violence of post-Katrina seemed uncannily familiar. Then again, so has the response. young—when she was 9 years old. But while Salaam got his training amid the tumult of the civil-rights era, Oliver got hers amid the turmoil that followed Katrina. Oliver’s home and possessions were destroyed in the flooding. Her family moved several times in the year after the storm, trying to find somewhere safe that was still near the school that Oliver attended in New Orleans East. Her school was one of the few stable things in that unstable time, and one of a handful still under supervision of the local school board. When her family learned that the school was going to be taken over by the state’s Recovery School District and that its fate was uncertain, they attended a community meeting on the subject. Oliver didn’t yet grasp all that was going on, but she knew that she wanted to keep going to her school. She raised her hand and asked state schools superintendent Paul Pastorek, “Do you know what it’s like to have your home destroyed? The only place I know is my school. When I’m here, I know where everything is.” The mood in the room shifted. The shouting stopped. And the school stayed under local control. 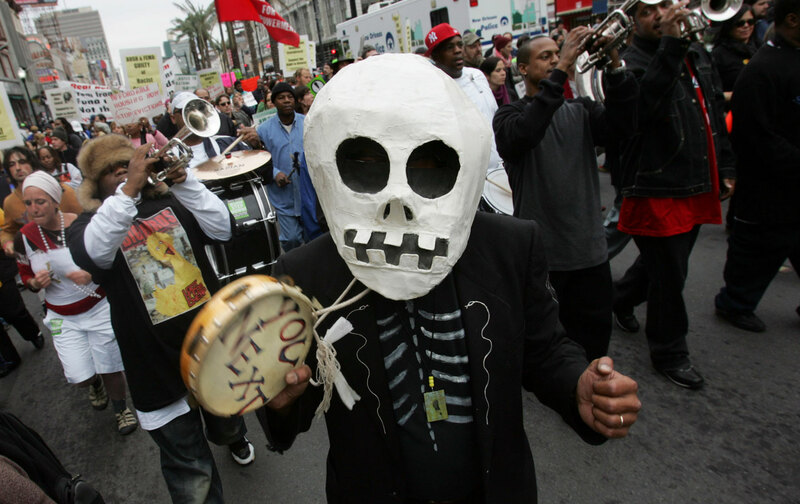 The anger and frustration after Hurricane Katrina spurred a wave of activism across the city. Neighborhood-association meetings were standing room only. The planning process seemed threatening and destabilizing, with some residents unsure if they would have their electricity and running water restored, or if their neighborhood would be declared a “green space.” The mayor and City Council hired separate planners, and several processes were under way simultaneously. El Congreso, founded in 2006, was one of those organizations. So was VAYLA (the Vietnamese-American Young Leaders Association), formed by young people in Oliver’s New Orleans East neighborhood; Rethink (short for Kids Rethink New Orleans Schools), an organization led by high-school and middle-school students fighting for education equity; and Silence Is Violence, a criminal-justice reform organization cofounded by Shavers after her brother was murdered. For these organizers young and old, activism is part of their identity as New Orleanians, and the changes they’ve seen after Katrina make them want to fight harder. Jordan FlahertyJordan Flaherty is a producer of The Laura Flanders Show and the author of Floodlines: Community and Resistance from Katrina to the Jena Six.